Obituary – Endres, Frank Lawrence « Perry High School Alumni Association, Inc.
﻿- 20-year-old son of Mr. and Mrs. John Endres, attended the Wingspring school southeast of Perry and St. Joseph’s academy in Perry before enrolling in the local public school system. He was born November 2. 1920, in this city and has been active in the local F. F. A. chapter and in the high school mixed chorus. He took part in the junior class play, the F. F. A. play and the one-act play “Lost and Found,” the 1941 senior play and the 1940 radio mystery. Frank has won awards in track, mixed chorus, junior play and orchestra. Hunting, fishing, photography and horseback riding are his favorite hobbies. He has not definitely decided whether to take a special course in radio, art or music in college, but says he may compromise by taking all three. 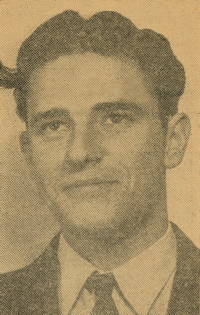 Frank Lawrence Endres, 82, of Oklahoma City, Oklahoma, was the son of John Carl and Edna (Manville) Endres. He was born on November 2, 1920 in Perry, Oklahoma and died Friday, June 20, 2003 at his home. Mass of Christian Burial will be 11:00 a.m. Monday, June 23, 2003 at St. Rose of Lima Catholic Church in Perry, Oklahoma. Father Tom Dowdell will officiate. Interment will be in St. Rose of Lima Catholic Cemetery. Services are under the direction of Brown-Dugger Funeral Home in Perry, Oklahoma. Memorials may be made to Catholic Charities in care of Brown-Dugger Funeral Home. Frank is survived by one sister-in-law, Janice Endres, Edmond, Oklahoma; one brother-in-law, Clay Powell, Oklahoma City, Oklahoma; one nephew, Michael Powell, Oklahoma City, Oklahoma; five nieces Ann Brutsche and her husband Mike, Laura Basile, Rita Harris and her husband Buck, and Karen Kenworthy and her husband Ken, all of Edmond, Oklahoma and Mary Endres, Blakeslee, Pennsylvania; and several great-nieces and great-nephews. He was preceded in death by his partents, one brother and two sisters.